The TOEIC® test can be taken at over 100 Authorised TOEIC Test Centres around Australia and New Zealand. •Locate a Public Testing Centre. 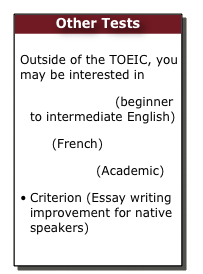 •Prepare for the TOEIC Test. •If you’ve sat your test already, order a copy of the Certificate of Achievement or your Score Report. When you are looking for an Authorised TOEIC Test Centre, use our links - or look for the logo (left) to confirm their authorisation to administer a TOEIC Test.